At the Heart of Haiti's Cholera Riots, Anger at the U.N. 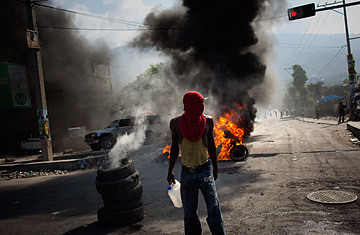 Pieces of rubble flew through the air as angry protesters marched up and down the streets of Port-au-Prince with signs that read "Down with MINUSTAH." They were protesting against the United Nation's stabilization mission in Haiti (whose French acronym is Minustah) and blaming the U.N. for the cholera epidemic that is sweeping through the populace. About 1,200 Haitians have already died from the bacterial disease, and there are more than 19,500 cases countrywide, according to the Ministry of Health. As the mortality rate for cholera patients edged up from 7% to more than 9% in recent days, graves on the outskirts of the capital were being filled with multiple white body bags. Public anger at the U.N. grew after the U.S. Centers for Disease Control and Prevention said the cholera bacteria now raging through Haiti matches strains that are commonly found in South Asia. Although many people blame a contingent of Nepalese soldiers for the outbreak  cholera had not been seen in the Caribbean nation for half a century  Minustah has said that the Nepalese passed their medical examinations and that none showed symptoms of the disease. "It's really unfair to accuse the U.N. for bringing cholera into Haiti," says Edmond Mulet, head of U.N. mission in Haiti. "We don't want to stigmatize any nation or any people." But the cholera outbreak has triggered the release of months of pent-up frustration with Minustah. The protesters converged on the Champ de Mars, a square filled with thousands of tent-dwelling survivors of the Jan. 12 earthquake. One of the demonstrators, Michou Chilojene, 20, who lives in a tent city, says she's used to seeing the white SUVs emblazoned with bold black "U.N." letters on the side doors going up and down the hills of Port-au-Prince. "I don't see Minustah doing anything serious. If they were, they would put their heads together with President [René] Préval and get us out from underneath these tents," says Chilojene. Mulet admits that Minustah has little direct involvement in the lives of everyday citizens. That's because, he says, the mission is to provide security and to set up a stable atmosphere in which others can then come to aid Haitians. "Minustah is not here to reconstruct the county," says Mulet. "We are here to provide the space for others to do their job." With 12,000 peacekeepers on the ground, Minustah has been in Haiti since the ouster of former President Jean-Bertrand Aristide in 2004. The country no longer has a standing army and relies primarily on U.N. peacekeepers for security. And yet the recent rioting in Haiti's second largest city, the northern port of Cap-Haïtien, caught the mission flat-footed. The peacekeepers there had been expecting a protest on Nov. 18, a national holiday commemorating a military victory over the French. But synchronized attacks on the Minustah outpost began on Nov. 15 and proved overwhelming. As a result, the city has had no electricity for several days, its airport has been closed, and barricaded roads have prevented cholera treatment from getting in. According to the U.N.'s Office for the Coordination of Humanitarian Affairs, violence continues to inhibit the humanitarian response to cholera in the surrounding area. In the meantime, Minustah says it is close to reaching one of its benchmarks by training 10,000 national police officers. Mulet says progress before the earthquake was moving steadily and that there were plans in place to downsize the mission in 2012. However, with 1.5 million people still homeless after the quake, plus an ongoing cholera epidemic and a new presidential regime coming in, Mulet says the mission will not downsize until 2014. The extended timeline has civil groups furious over what they describe as the unwelcome presence of a foreign military force in Haiti. Mario Joseph, director of Bureau des Advocats Internationaux, a civil rights organization, says, "It's an occupation, and it's a useless mission. They must leave." Joseph adds that protests will continue as the country moves closer to the Nov. 28 elections, raising fears that they may be disrupted. But Mulet says "everything is in place" for elections that will run smoother than in the past. Peacekeepers, he says, will be no more than 20 minutes away from every polling station.